It's not easy to live with leg ulcers. Open wounds can be painful, difficult to heal, and the likelihood of recurrence is significant. But prevention is possible. One warning sign that you may be developing a venous ulcer is noticeable skin changes in the lower legs, such as dryness or thickening. Another sign of ulceration may be discoloration of the legs, typically dark red, purplish, or a brown, woody appearance. Other possible indications are aches or pains in the legs, especially when standing or sitting for prolonged periods. Varicose veins are another possible warning sign. Varicose veins, as with any form of venous disease, are often hereditary. If you have varicose veins—or a family history of varicose veins— consider getting evaluated and treated for them before they lead to ulceration. 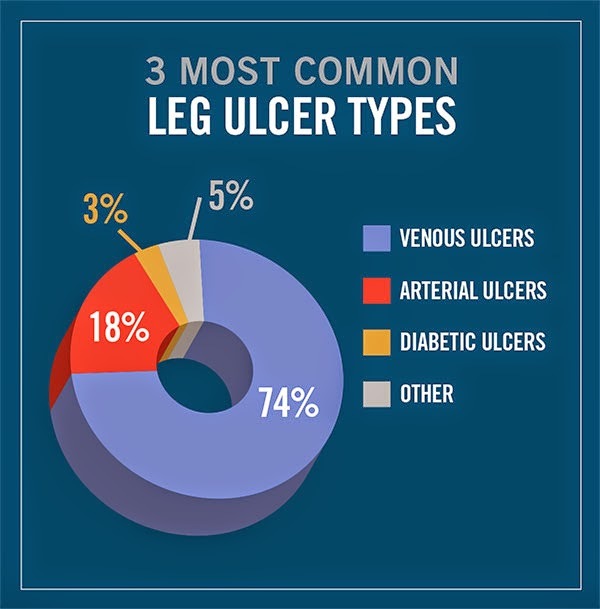 Risk factors for venous ulcers include older age, a history of deep vein thrombosis (DVT), venous insufficiency, and previous ulcers or leg injury. Though you can’t change your genetics, you can modify other things. If you have a job where you’re on your feet all day, wear graduated compression stockings. There is often a misconception among patients and physicians alike that there is nothing you can do for venous ulcers. The fact is wound care specialists use a variety of modalities to heal patients’ wounds, including aggressive compression therapy, skin grafting and “low-tech” therapies like elevation. It is important to remember that although wound care specialists can treat and even heal wounds, unless the underlying cause is addressed, it will only reoccur. If the wound is identified as a venous ulcer, then treating the incompetent vein valves that contribute to venous ulcers is key for lasting results. Experts agree that the earlier the intervention and treatment, the better chance a wound has to heal and stay closed. And, of course, patients with venous ulcers are best managed by a multi-disciplinary team of primary care physicians, wound care centers, and professionals who specialize in venous care. Leg ulcers can occur at any stage of life and, without treatment, can cause overwhelming problems. When blood pools in the lower leg over a long period of time, the condition is referred to as venous stasis. When blood leaks into the tissue of the skin it can cause swelling and damage to the tissue. Tissue damage can result in wounds, or ulcers, that are chronic and do not heal if the condition is left untreated. Ulcers may be painful or itchy and often require constant care and dressing. There are three large classes of ulcers: diabetic, arterial, and venous. Of the three types, venous, or vein-related, is the most common. In fact, venous disease is thought to account for approximately 80% of chronic leg ulcers. Venous ulcers can be caused by venous insufficiency or by a wound that has been exacerbated by venous insufficiency. Leg ulcers are often an indication that vein disease has reached an advanced stage. However, the key to properly treating and managing them is to first get them diagnosed. Though ulcers may appear similar, each one has a different cause and thus, very different treatments. Clinical appearance is the first clue to distinguishing between venous and arterial ulcers. Typically, venous ulcers can appear anywhere between the knee and the ankle, while arterial ulcers are usually found between, or on the tips of, toes. Another sign is discoloration. Venous-related wounds tend to be ruddy, and the surrounding tissue may be red or hyper-pigmented due to hemosiderin (a pigment formed by the breakdown of hemoglobin). In contrast, the wound bed of an arterial ulcer tends to be black, grayish, or yellow. The most effective way to diagnose a venous ulcer is with a duplex Doppler ultrasound, which reveals whether or not the blood is flowing in the proper direction, or if there is any pooling occurring. Ulcers do not heal on their own, but even those who are already experiencing this late-stage symptom can have excellent success with treatment. If you have skin breakdown or infection due to ulceration, you should visit your doctor immediately.